- High quality 3.5 mm thick stainless steel sharp blades. - A safety stop blade will greatly reduce the risk of injury to your pet. - A safety stop lock will greatly reduce the risk of pet owner or child accidental injury. - Free Nail File could file the sharp nails after cutting your dogs and cats nails. - Ergonomically designed non-slip handles are strong, lightweight, and comfortable. 2. Hold your dog claw clippers in your hand and your pet's paws in the other. keep your dog lying quietly so that the dog doesn't get hurt by the blade. 3. Sharp blade can shorten the nail quickly, so check the pet's nail condition before cutting it to determine the length to be cut. It is recommended not to overcut each time. 4. 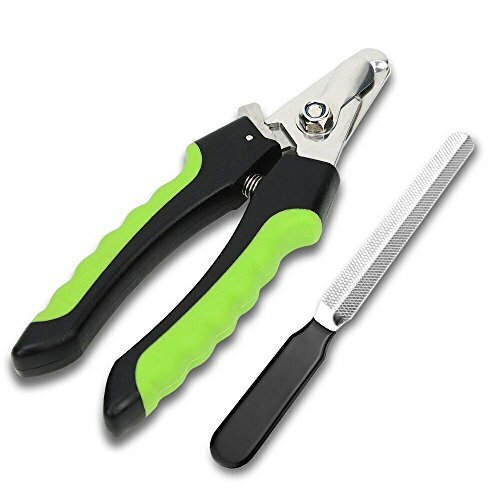 Our dog nail clippers with file has safety blades and locks that can be turned off when not needed. Avoid unnecessary injuries to pet owner and child. Professional Sharp Stainless steel blade for quick cutting - our unique design allows you to easily take care of the claws cutting and ensures that your dog stays calm and relaxed at the same time. Maximum safety - The Mudeela dog nail clippers set guarantees maximum safety for the dog. The integrated protective device prevents the claws from being cut too short. With the safety lock, the dog nail clilppers are always securely closed when not in use. Ergonomic and easy to use - the non-slip rubber grips have been ergonomically designed and offer a secure grip so that the claw cutting becomes a safe experience for you and your dog. Free nail file for dogs - the Mudeela dog clippers set is a complete solution for claw care. With each of our dog clipper, you get a free nail file to file sharp and rough areas after cutting. Buy Worry-free - for every Mudeela dog clippers set, we provide a 12-month guarantee as well as a 100% money-back guarantee for 90 days. So if you do not like the dog nail clipper for any reason, simply inform our excellent customer service guy, which will refund you the full purchase price quickly and uncomplicated - without giving any reasons! If you have any questions about this product by DELOMO, contact us by completing and submitting the form below. If you are looking for a specif part number, please include it with your message.